With 4 indoor water parks and 4 outdoor water parks set on a 600 acre resort, the Wilderness Hotel in Wisconsin Dells is considered to be America’s largest waterpark resort destination. That’s 12 football fields worth of astoundingly awesome jaw-dropping thrills and adventurous water thrill rides. Are you ready? In all, there are 52 slides, 6 lazy rivers and lakes, the wave pool, 8 kiddie and toddler pools with play structures, 9 hot tubs, and 8 activity pools! We have taken a trip to the Dells many times. We try to go at least once during both the summer and the winter months. We have been to the Wilderness Resort Wisconsin Dells on four different occasions over the past 5 years. They just keep growing and adding great new lodging and water park options. They really have something for all ages as our family keeps growing and growing up. We really think that the prices are reasonable for the value that is offered as well. We always try to arrive several hours before the official check in time. We don’t expect to get a room early, but even with the check-in at 4 pm and check-out at 11 am, the resort water park policy allows you to check-in early so you can use the water park while waiting for your room, and then again all day after you check-out. So come early and stay late. They also have a changing area with lockers large enough to fit clothes for two to three people. Before making that call to Aunt Alice and Uncle Henry to see if they can let you borrow the guest house, there is one small detail you should know. The Wilderness Water Park is very exclusive. It is for the guests of The Wilderness Hotel and Golf Resort only. You have to stay at the hotel to play at the hotel. 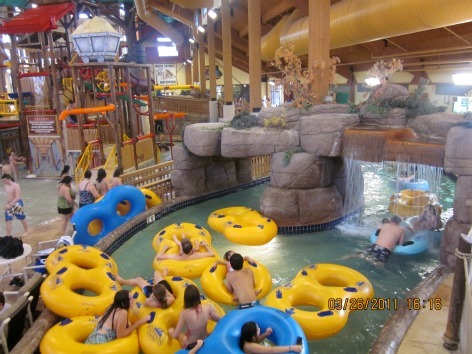 Think the Wilderness Resort Wisconsin Dells is for summer fun only? The Wilderness Territory Resort Water Park is open all year round. Winter, summer, spring and fall, it does not matter. Even when there is a blizzard raging outside you can still relieve the tedium and winter blues by taking a trip to the resort and enjoying the fun and exhilarating adventure of some of the wildest rides in the world. 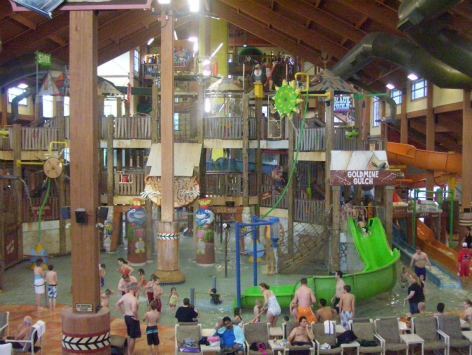 We stay at the Wilderness Resort Wisconsin Dells because there is something to do for kids and adults of all ages. We can go to the same place and everyone has a great time. Winter was never this much fun with 4 full sized indoor water parks to quench your thirst for adventure. Each water park area is set up for just about every age. Within each area, they have set up some great areas for the younger crowd. They usually include a couple of small slides, sprinklers and bubblers with zero depth water entry. For the older kids and even adults, they have many great variations of slides for speed and turns or both. 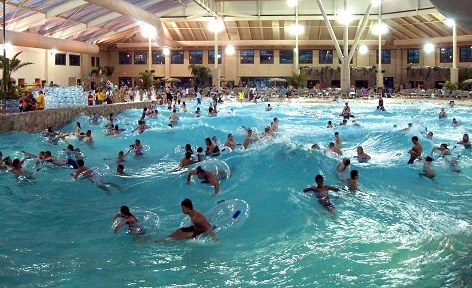 The wave pool is awesome and the indoor-outdoor hot tub is great during the winter months. It’s almost magical out there when the snow is falling. 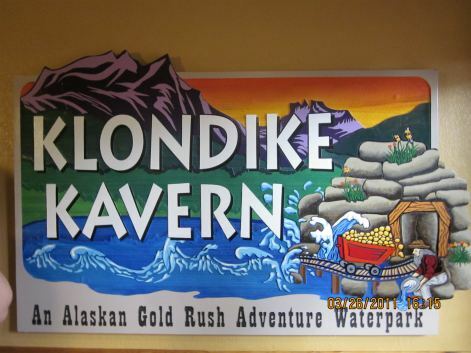 The older kids’ favorite rides were the Black Hole at the Wild West and the Hurricane at the Klondike Kavern. The Hurricane takes your breath away...and was just a little too much, even for me. What do you think of a 70,000 sq. ft. dome filled with wild rides and a private poolside cabana to relax in? What if we add the ability to sunbath in the heart of winter? The dome at the Wild WaterDome Indoor Water park is made up of state of the art Foil Tec material that not only allows the beautiful live palms and banana trees, but will also allow you to go home in December with a beautiful summer tan. What else does this futuristic park hold in store for you? How about the largest indoor wave pool in America, the Dueling Mammoths raft race, a play lagoon for the kiddies, and private cabanas. It is so nice to take some time and get away in the winter months, especially to the Wild WaterDome at Wilderness Resort Wisconsin Dells, where you tan all year round. It sort of gives you the feeling you are on a tropical vacation. The wave pool is the one of the biggest I have seen for an indoor waterpark. It’s a walk in beach style entry and the deep end is six feet with some really nice big rolling waves! If you need a little more excitement, the Klondike Kavern section of the Wilderness Resort Wisconsin Dells may just be your “cup of tea “ with 65,000 sq ft of gripping jam-packed fun . Some of the awe inspiring things to be found here are a 180 foot long body slide, not one but two - 500 ft long tube slides, each with a full five-story tall drop. 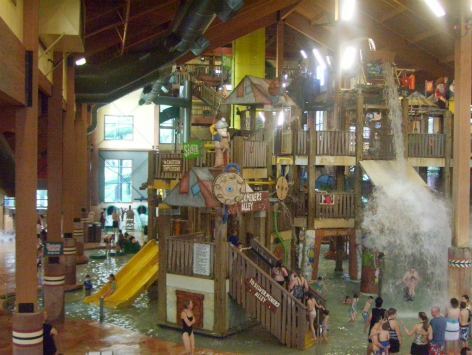 Welcome to the rootinest tootenest section of the indoor water parks at the Wilderness hotel in dells. One of our favorite rides in the Wild West area is the Fantastic Voyage, which is a fast, five story drop family raft ride. The area also has 4 speed slides and a very nice large spa. This also has a smaller wave pool, and has a huge play area for the kids with a big Bucket Dump the kids just loved. Cubby’s is a 35,000 sq. ft. water park with all the fun and adventure of the big parks scaled down for toddlers and smaller kiddies. With tiny body slides, an interactive multilevel play area, and a water basket ball court, Cubby’s Cove at Wilderness on the Lake is the perfect playtime for the smaller family members. 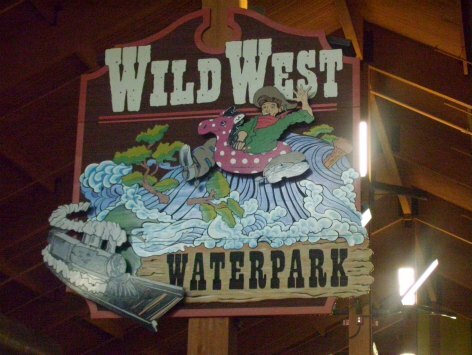 It’s just too nice outside, so check out these exciting fun in the sun water parks at Wilderness Resort Wisconsin Dells; but remember these sections of the park are open air and not open during the cold months of winter. This area is an amazing outdoor waterpark with over 110,000 sq. ft. of outdoor water fun. The older boys spent a lot of time at the Gold Rush Tube Slide, a 400-foot tunnel that launches from a 40-foot high enormous tower. There are also two more good water slides, a nice lazy river, three pools, Bear Foot Island, and Toddler’s Cove that our youngest really enjoyed. It was very relaxing for us with over an acre of deck space with lounge chairs and tables. Located at Glacier Canyon Lodge, the Lost World features 3.2 acres and 95,000 sq. ft. of sheer fun with a dinosaur theme. Check out the Lost World Adventure River, a meandering river that will shoot you through the rapids, uphill, and down twisting curling slide, race Halley’s comet head first down a super fast slippery slope, or just hang out in the lily pad pools or play water basketball. The waterpark area also features a new kiddie area with a family friendly dinosaur theme and little slides for younger children. Set on 40,000 sq. 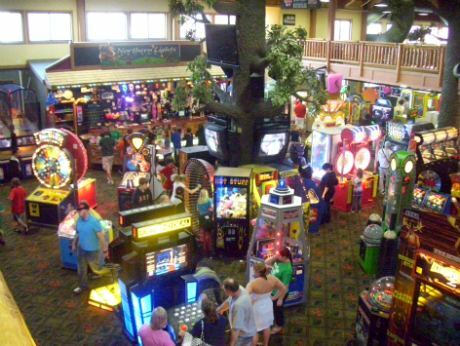 ft., the Lake Wilderness area of the Wilderness Resort Wisconsin Dells boasts a 13,000 sq. ft. swimming pool where you can swim or relax, Rafters Rage tube slide, Lil’ Chutes 100 ft. slides, a lap pool, a hot spa, and a children’s wading pool. 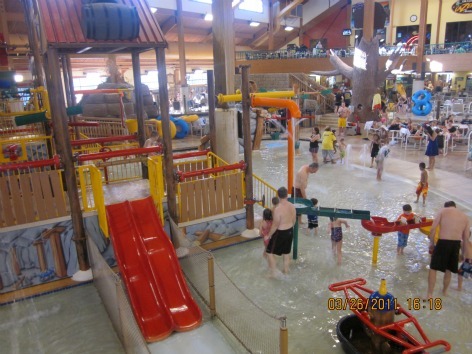 Do you love Wilderness Resort Wisconsin Dells Cubby’s Cove inside? Check out the 15,000 sq. feet of Cubby’s outside. All the same great activities rides and adventures for the little ones but out in the bright summer sun with scenic views of Lake Delton’s private beach. The room options within the resort are huge. Hotel rooms to suites to condo style to full size cabins are all available. We chose the Double Queen Suite for our family of five. It had everything we needed for comfort and convenience. The room was clean and roomy for us with a nice size TV. All the rooms are sort of a rustic style to fit in with the Wilderness Resort Wisconsin Dells theme of course. The three buildings of indoor water parks are all connected, so if you stay at the hotel, you never have to go outside. Regarded as one of the top 5 spas in America, Sundara Inn & Spa is much more than just a spa, offering some of the most luxurious overnight accommodations available in the midwest. Guests may choose to spend the night or just visit for a day trip with unlimited use of the entire facility. The intimate resort and spa is nestled on twenty-six acres of fragrant pine forest adjacent to the championship Wild Rock Golf Club at the Wilderness Resort Wisconsin Dells and features some of the most beautiful natural scenery in Wisconsin. Amenities include a relaxation lounge, heated outdoor infinity pool open year-round, an open air fireplace, delicious and healthy spa cuisine, state-of-the-art off-site fitness studio and much more. Plus, guests have unlimited access to the spa's signature Purifying Bath Ritual and a sumptuous spa breakfast buffet with every stay. Sundara also features a wide selection of salon and spa services, from holistic skin care and massage therapy to salon services and body treatments, you're sure to find something you'll love. Whether you choose to spend the night or perhaps just linger for the day, a visit to Sundara will Energize Your Soul! Mega Arcades - Three huge arcades with interactive games & prize redemption. 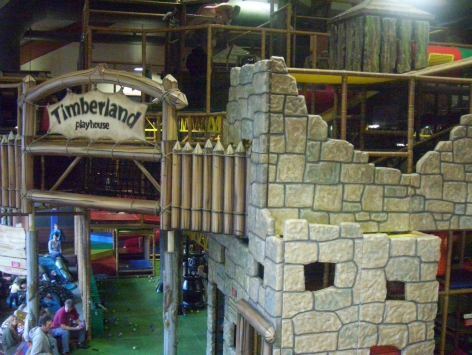 Four-story Timberland Play Park - 30,000 sq. feet dry play park offers hours of fun with foam ball blasters, a ball fountain, crawl spaces and crazy slides. WildKids Club - Activity center for families with crafts, games & movies. Wilderland Picnic Area - Outdoor picnic area, stroller walking path & pond. Wisconsin’s first Canopy Zip Line Tour - Ride the zip line across the Lost Canyon, spanning nearly 2,500 feet on six towers! Explore three indoor, black light, 3-D mini golf courses - The Wild Buccaneer, a pirate adventure; The Wild Abyss, features huge aquariums with live sharks and Big Fish, which has fresh-water fish aquariums and a Western theme. There’s also an outdoor dinosaur-themed Jurassic Mini Golf 18-hole course. 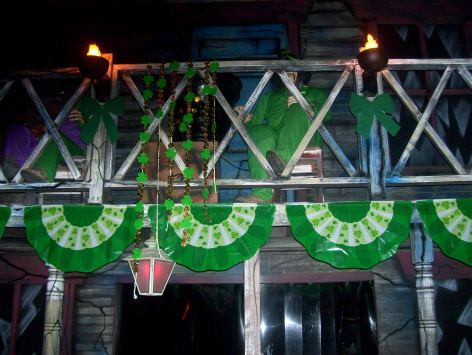 Indoor bumper boats, outdoor go-kart track, a haunted village and the OK Corral Lazer Tag Arena. 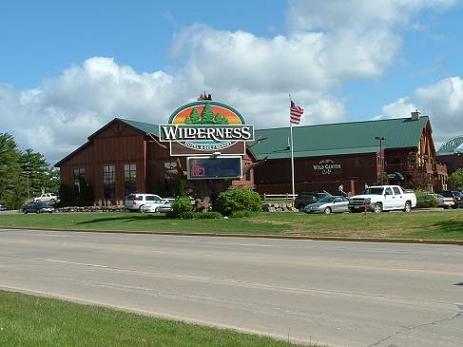 There are many eating, dining, and adult beverage options located within the Wilderness Resort Wisconsin Dells. 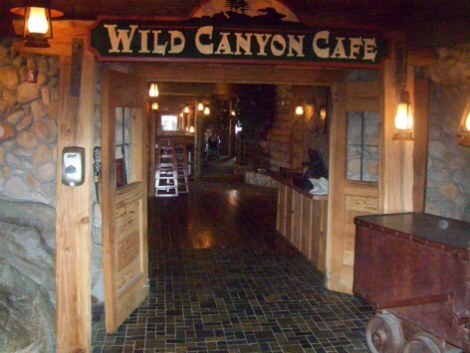 We ate at Survivors and the Wild Canyon one night and found that the food was good and not overpriced. We also took advantage of the buffet breakfast one morning, in room pizza one night, and of course, Starbucks coffee every morning. 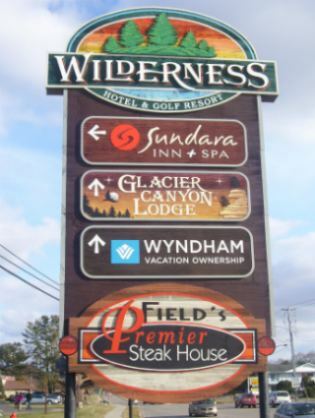 Dining options within walking distance of the Wilderness Resort Wisconsin Dells resort include - Field’s at the Wilderness, Monk’s, Sarento’s Italian, Dominos Pizza and the Cheese Factory. We have actually eaten at all of the above and I highly recommend them all.